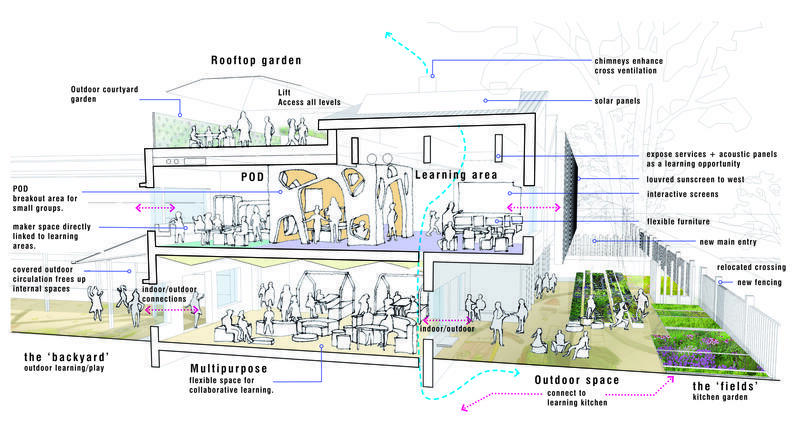 We recently prepared a scoping study which proposed a series of prioritised adaptations to the Grange Primary School’s learning environments as part of the Building Better Schools programme. The scope was developed through a consultation with the school community, and reviewing current and future needs. The alterations and additions strategy improve the school’s capability through contemporary learning environments with increased flexibility and interconnectivity, with indoor and outdoor learning spaces and expanded STEAM capabilities. Improvements to the ecological and environmental footprint form part of the proposal, with visible systems creating learning opportunities. Passive and active systems utilised include shading, landscaping, water reuse, solar and natural cooling systems, and low-embodied energy, sustainable source and low-maintenance materials and fittings.